Anyone who's ever attempted a home-fringe trim, or, worse, gone the whole hog and given themselves a Zooey-Deschanel-inspired blunt fringe only to realise they're more of a whispy–fringe kid, knows that a good fringe isn't easy to come by. And when fringes go wrong they can go so very wrong. We asked some of Brisbane's best hairdressers for their expert advice on how to choose the right fringe for your face shape. To find your bangs nirvana, read on. The uber-talented team from New Farm salon, Lila Boheme, are not afraid of a bold cut or cool colour, but they don't mess around when it comes to your fringe! 'We would steer clear of a short blunt fringe as it emphasises width across the top of the face', say Effie and Lisa. Revolution Hairdressing's senior stylist, Sandra Favia recommends a rounded or arced fringe for those with a square face (the gang at this Newstead hairdresser are experts at choosing just the right 'do for your face shape, so when he dishes out the hair advice, we listen up!). Sandra says, 'It's also better to soften the fringe so it is more jagged or choppy—also, don't have it too deep or heavy'. To maintain your ideal fringe Sandra suggests regular cuts, 'I recommend every 3 weeks if you wish to maintain a constant fringe length. We offer this as a complimentary service to all our clients. Due to the forehead under a fringe been a high sweat-and-oil producing area, it's best to use dry-based products such as Kevin Murphy's Anti Gravity Spray or Body Builder. 'Olivia Wild is renowned for her stunning features, but she is also one of few celebrities with a square face who makes a fringe look amazing,' says Sandra. Sandra recommends square-faced lassies steer clear of blunt, heavy, and straight fringes. 'If you cut the fringe blunt or straight it makes the squareness of the jaw more pronounced,' she says. One of our fave New Farm hairdressers, Luke Reynolds, suggests clients with oval-shaped faces who are wanting to try a fringe (or go back to a fringe) try a gorgeous and versatile face-framing fringe with some slight feathering to soften the look. Think Alexa Chung and Jane Birkin. Luke says, 'This look is great because you can sweep it to the side or part slightly in the middle to change it up. 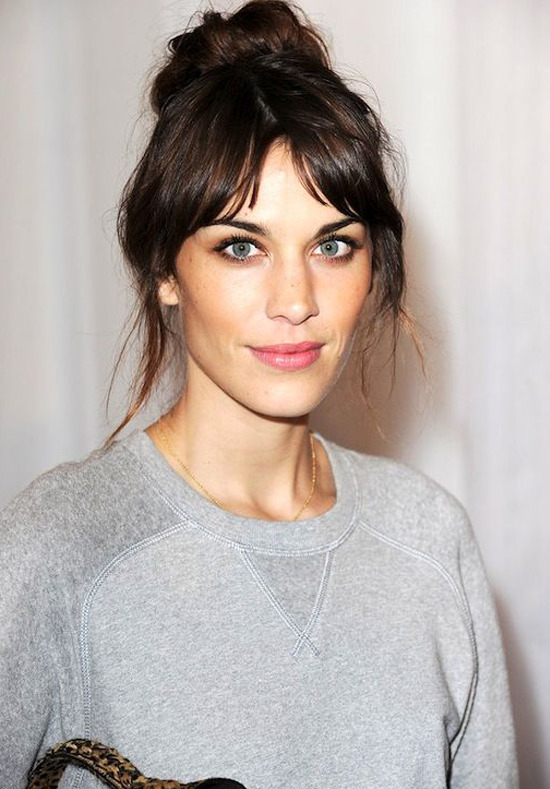 Side fringes can make an oval face appear quite long so it's best to opt for a fuller fringe'. Making rash decisions! Don't jump into a fringe without a lot of consideration. 'A fringe is a commitment, so consult with your stylist before taking the plunge,' Luke says. 'We offer our clients complimentary between-appointment fringe trims to keep their look in check. For a round face, talented tress tamer, Sarah Wall, Salon Art Director at the beautiful Toni & Guy salon in The Emporium, recommends a soft, textured sweeping fringe with a middle part to elongate the face. 'Lara Bingle is a really great example of how well this style suits this face shape,' she says. 'To maintain this type of fringe, you would apply two sprays of Label M Blowout Spray to give a soft textured hold, and blow dry with a large round brush, giving it a sweeping effect'. 'The worst fringe for a round face would be a full solid fringe, it would only make the face look rounder,' Sarah says. So can curly girls rock a fringe? Though the '80s would have you believe otherwise, the general consensus from Brisbane's best hairdressers is that curlies can totally work bangs, provided they are willing to put in the styling time. Lisa from Lila Boheme warns, 'Only cut if you're committed to styling! I have a curly hair fringe, I need to use a curling wand to control my curl and relax the frizz. I would cut a fringe at random lengths to allow for bounce factor'. Sandra from Revolution Hair also gives curly fringes a big thumbs up. 'Curly hair can create stunning fringes,' she says.